This stylish, affordable low loft bed is made from solid hardwood such as maple, birch and aspen. 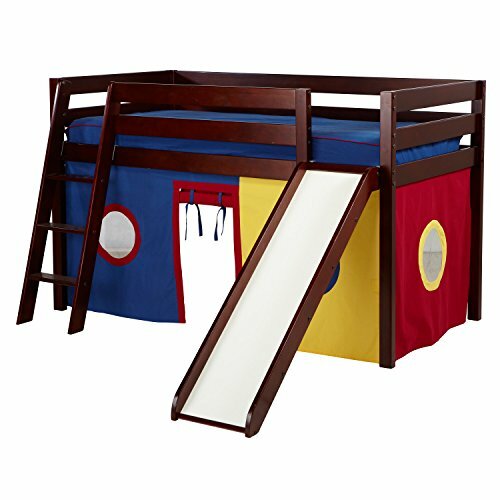 The colorful underbed curtain makes a great playhouse, and the slide provides a great escape. Solid hardwood construction and fun underbed curtains set the Jackpot kids loft bed apart. The bed includes upper/lower slat rolls--no Bunkie Board needed. Tall 14" guardrails safely accommodate most mattress types. Angled ladder with 4” steps and rounded edges offers safe, easy safe climbing in socks and jammies. Space-saving design is great for smaller kids rooms. Underbed Height is 32.5"
Jackpot is a member of the Maxwood family, with over 10 years commitment to superior quality, safely, durability and fun kids and youth furniture that is crafted to grow with your family. If you have any questions about this product by Jackpot! Essentials, contact us by completing and submitting the form below. If you are looking for a specif part number, please include it with your message.